Sandpiper Golf & Country Club is a 55+ community in Lakeland, Florida. Residents of this community enjoy great amenities and a low-maintenance lifestyle. Built between 1985 and 1998 Sandpiper Golf & Country Club consists of 1,153 attached and single-family homes available on a resale-only basis. Situated in Central Florida, residents of this community enjoy all the great opportunities for entertainment and recreation in the area. Residents of Sandpiper Golf & Country Club enjoy a wide array of amenities. Inside the clubhouse, residents can find an elegant ballroom with a stage, multi-purpose room, catering kitchen, billiards room, card room, library, table tennis, and a fitness center with cardiovascular and weight-training equipment. Outside the amenities continue with an outdoor pool and spa, sundeck, two tennis courts, eight shuffleboard courts, and three horseshoe pits. The centerpiece of the community is the 18-hole golf course. This public course offers great play for all skill levels. A secondary recreation center offers additional space for community events. Numerous clubs meet in the multi-purpose room that also has a catering kitchen, which is a great place to throw a party. Outside there are two additional tennis courts and a pool ensuring residents are never too far away from staying active. Homebuyers looking to purchase a home in Sandpiper Golf & Country Club can select from attached or single-family home available on a resale-only basis. Attached homes in the community offer two bedrooms, one to two bathrooms and either a one-and-a-half to two-car garage or lot parking. These homes offer the ultimate in low-maintenance living. Single-family homes range between two to three bedrooms with one-and-a-half to two-and-a-half bathrooms, and an attached one to two-car garage. These homes offer first-floor living and open floor plans great for active adults. Most homes have back patios with covered lanais. 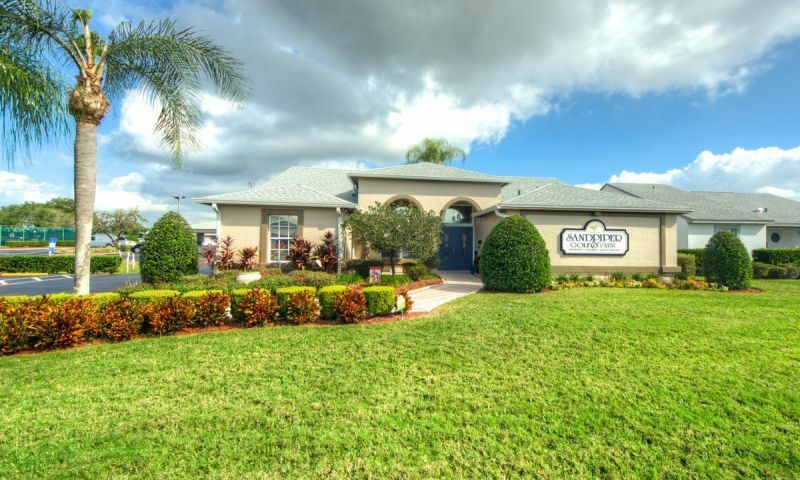 Residents of Sandpiper Golf & Country Club enjoy a relaxing low-maintenance lifestyle. An annual homeowners' association fee covers general maintenance of the community grounds as well as all amenities and lawn care of each home in the community. This low-maintenance lifestyle allows residents to forget about tedious tasks and better enjoy time spent with family and friends. With so much extra time on their hands residents of Sandpiper Golf & Country Club enjoy the numerous clubs and activities offered in the community such as computer club, gardening club, and tennis club. No matter what your hobbies and interests are there is something for everyone at Sandpiper Golf & Country Club. Sandpiper Golf & Country Club in Lakeland is situated in sunny Central Florida. Active adults of the community enjoy the numerous conveniences in the surrounding area for shopping, dining, and entertainment. Located between Tampa and Orlando, this community offers a quiet lifestyle with major cities nearby. Lakeland is named for the numerous fresh water lakes in the area offering great fishing, boating and watersports. Many major league baseball teams conduct their spring training workouts in the area such as Detroit Tigers and the Houston Astros. With great opportunities for recreation and entertainment in a scenic location, Sandpiper Golf & Country Club attracts active adults from across the country. The main clubhouse at Sandpiper Golf &amp; Country Club located at 5883 Mallard Drive offers numerous amenities to keep residents social and active. Residents of Sandpiper Golf &amp; County Club have full use the recreation center located at 5949 Grouse Drive. There are plenty of activities available in Sandpiper Golf & Country Club. Here is a sample of some of the clubs, activities and classes offered here. Attached homes in the community offer two bedrooms, one to two bathrooms and either a one-and-a-half to two-car garage or lot parking. These homes offer the ultimate in low-maintenance living. Please Note: Floor plans are not available at this time. Single-family homes range between two to three bedrooms with one-and-a-half to two-and-a-half bathrooms, and an attached one to two-car garage. These homes offer first-floor living and open floor plans great for active adults. Most homes have back patios with covered lanais. Please Note: Floor plans are not available at this time. Lovely, well-maintained community with tons of activities. 55places.com is not affiliated with the developer(s) or homeowners association of Sandpiper Golf & Country Club. The information you submit is distributed to a 55places.com Partner Agent, who is a licensed real estate agent. The information regarding Sandpiper Golf & Country Club has not been verified or approved by the developer or homeowners association. Please verify all information prior to purchasing. 55places.com is not responsible for any errors regarding the information displayed on this website.